The Beacon of Hope Shelter can always use food and one thing groups, businesses or individuals can do is help us keep our kitchen stocked. Every Third Saturday of every month. Those wishing to make food donations can drop them off at the shelter between 8 a.m. and 5 p.m. Food items needed include canned fruits and vegetables, canned creamed soups, dry pasta, cereal, flour, sugar, condiments, meat that can be frozen, coffee, creamer, other canned goods and non-perishables. If you would like to make a donation other than on the ‘food drive day’ please call the shelter at 955-3366 to make arrangements for someone to be there to accept your donation. Your generosity is much appreciated. 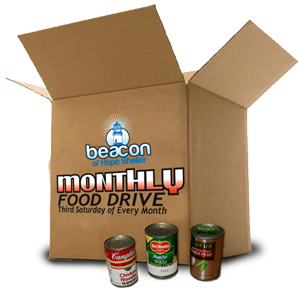 Spread the word – Every Third Saturday of every month – Beacon of Hope Shelter.